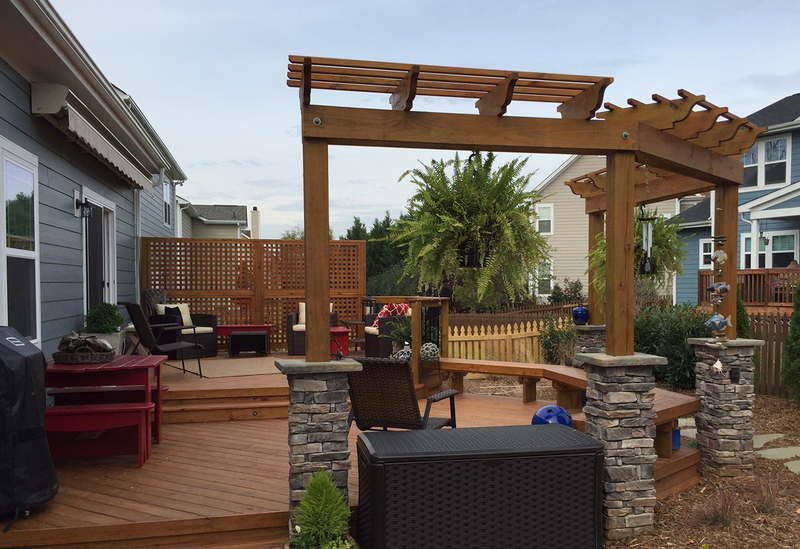 Are you looking for an outdoor builder for your Fort Mill SC deck, patio or porch? Archadeck of Charlotte has been building projects in SC for the last 29 years and we’d love to build your next outdoor projects. Please take a look at a few of our projects in Fort Mill and a number of the neighborhoods we serve in and around town. Above you’ll see a pergola covered composite deck. The deck is made of Trex composite and has a beautiful set of flared stairs. 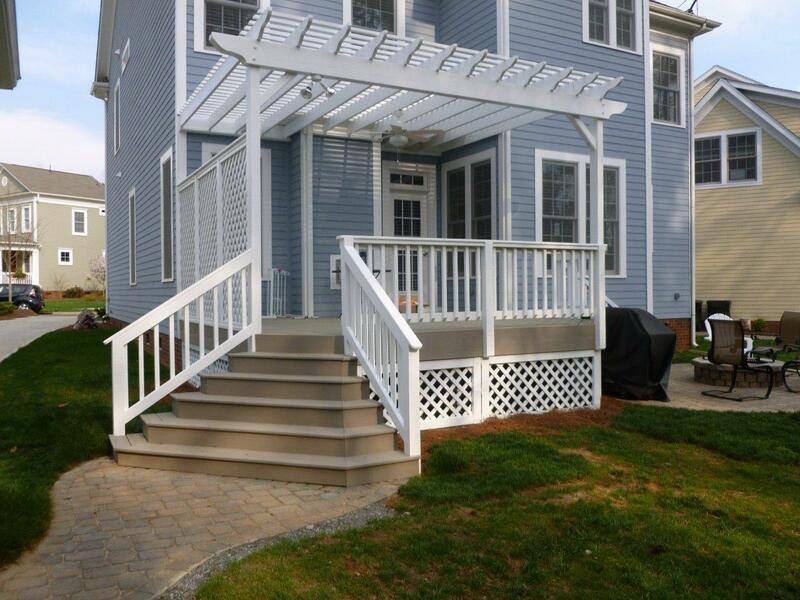 The white picket railing gives this deck the character of the homes in Baxter Village. The side wall is a lattice privacy wall and the lattice matches the deck skirting. The pergola provides a little bit of sun protection while still ensuring that plenty of natural light makes it inside the home. To the side of the deck is a paver patio with custom stone fire pit. Above is a 3-season room complete with an EZE-Breeze vinyl window system. These 4-track windows can be kept completely closed or can be open to expose up to 75% of the underlying screens. To the left of the picture above, you’ll see one window opened to 75%. To the right of the picture, you’ll see one window open to 50%. 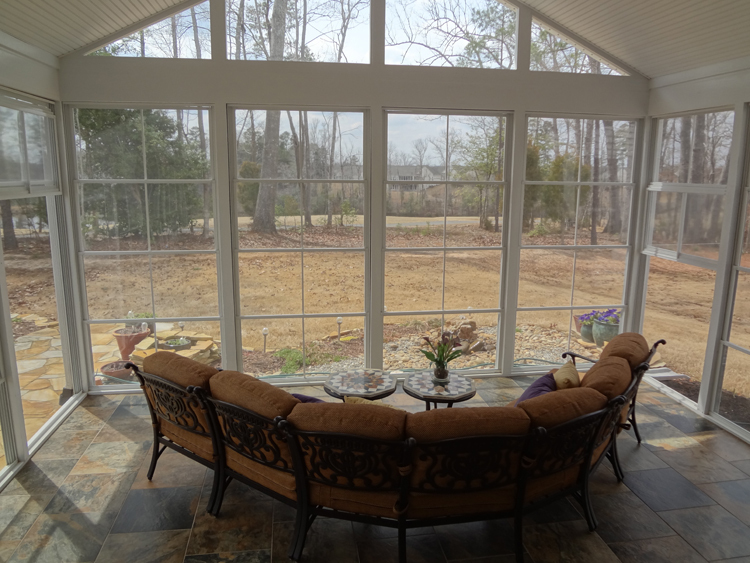 If you’re looking for a 3-season room or 4-season Fort Mill Eze-Breeze porch, give us a call for your free consultation. The statuesque and stately homes of Effington South command custom outdoor spaces built to match the elegance and also the exterior color pallet of the home. One thing that we know is important to homeowners is ensuring that the spaces we add on look original to the home. Looking at the screened porch above, you’d think it was always there. We pay meticulous attention to details like rooflines, soffits, gutter colors, and paint colors so your new space does not look added on. Above is the rest of the new outdoor space at this Eppington South home. In addition to a screened porch, these homeowners added a large Trex composite deck with a beautiful black metal railing. Notice the way the dark colored railing spindles ensure you have tremendous visibility to the house from the back yard. You have similar great visibility while sitting on the deck. 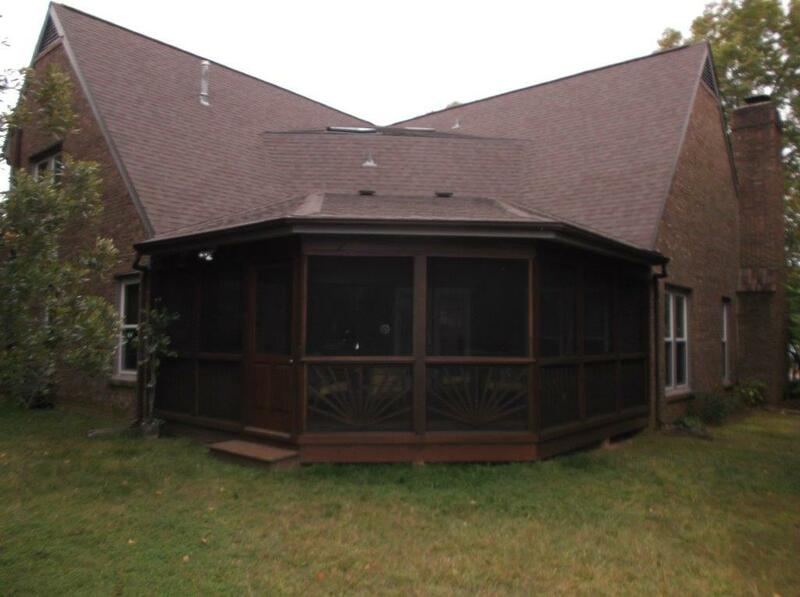 Notice the way the lattice skirting ties the deck and porch together. This combination outdoor living space also includes a paver patio complete with a custom stack stone fire pit. When you select Archadeck of Charlotte to build your new outdoor living space, we work with you to design a space that fits how you want to live outdoors. We want your space to be as functional as it is beautiful. The 2-level deck above has a number of custom design features and a number of functional features making it a spectacular Fort Mill multi-level deck. The decking is done on a diagonal for aesthetic appeal. Each of the 2 levels serves as an independent outdoor living area. The area has a large bowed edge with a wrap-around built-in bench. The stone pillars hold up a decorative corner pergola element that can be used for hanging anything from potted plants even to a privacy or sun shade. The back wall comes complete with a privacy fence made of lattice stained to match the entire space. The screened porch above was carefully designed to not only work functionally with this home, but to make sure it did not look added on. Everything from the hip roof to the matching roof tiles and matching soffits ensures this spaces looks like it always existed with the home. Whether you’re the primary indoor chef or the primary outdoor chef of this home, you’ll love this fantastic large outdoor kitchen. 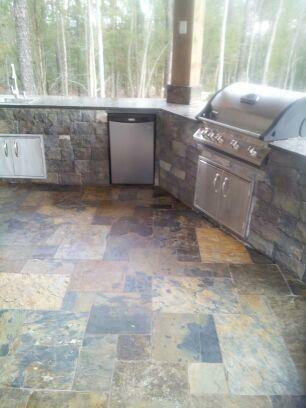 The outdoor kitchen area has a tiled floor which you absolutely can have in your outdoor space. The stone outdoor kitchen unit is a perfect complement. The kitchen has abundant counter areas along with a built-in grill, built-in outdoor refrigerator and also a built-in storage area and sink. It’s completely wired for sound so you can bring out anything from your outdoor speakers to your blender, smoothie maker or even your waffle maker. The above paver patio in Baxter Village has some fabulous design and functional elements. The patio is surrounded by a circular retaining wall that also acts as a seating wall. 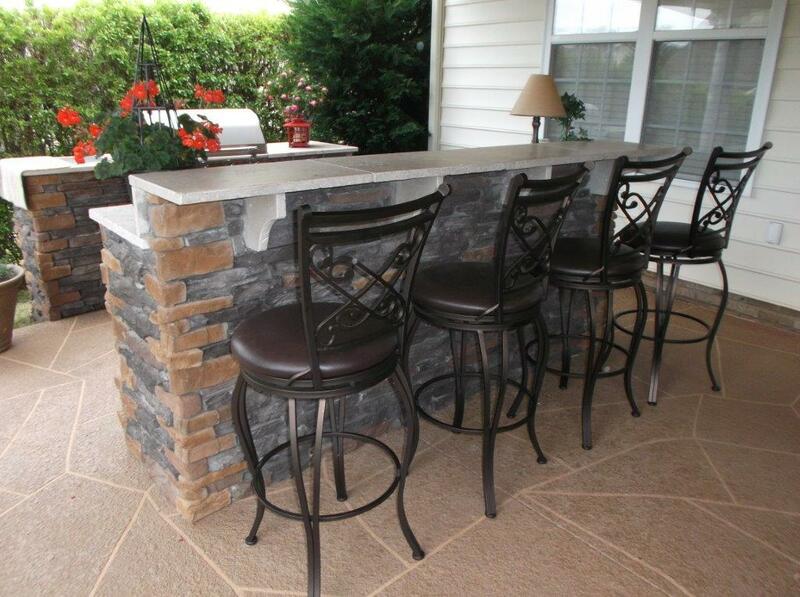 Stone pillars flank not only both sides of the seating wall but also the sides of the grilling wall. The pillars are great areas for focal decorating items such as garden arrangements or other decorative elements. The stack stone walls complement the stone patio beautifully. A great alternative to a paver or stone patio is a stain and scored concrete patio. At a more economical price than pavers, this stained concrete allows room in the budget for other elements such as this outdoor kitchen and outdoor bar. Take a look at the beautiful stonework that give the kitchen and bar a custom flair and tremendous aesthetic appeal.